The gang are back again in another installment in the immensely popular Hi-5 series. This time the gang takes us out and about in the wild with a load of fun songs and dances to participate in. It seems to me that this disc is a really great addition to your kids collection and will be one that is bound to provide plenty of entertainment for a long time to come. This disc certainly entranced my young child for the duration it was playing! The first time, she just stood there entranced (she is two years old) and the other plays involved her singing and dancing as she learned the songs and activities. I loved the fact that in the Hi-5 shows that the props and sets are something you can build in your own home for the most part with a minimum of fuss. 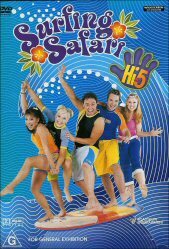 There are a number of scenarios that the kids can act out ranging from going into the heart of Africa to the depths of the ocean as Hi-5 sing and bop their way through yet another fabulous DVD. The only let down on this disc was the absence of any real extras. Sure there was an option to do karaoke and to listen to separate songs, or songs by performer, however it wasn't enough meat for me to get my teeth into. Another great thing about this license to print money is that they have songs on their DVDs that the kids have already seen on the television so they can immediately relate to what's on the screen. A song that sprung to mind, and possibly my favourite on the disc was "Reach Out". The way that the Hi-5 team interact with their little audience is spellbinding and for the most part you can see them getting a kick out of how the kids dance and sing along. I thoroughly recommend this disc to one and all.